It was mid-December, and I was feeling decidedly un-Christmassy. Step up Co-Wheels and Westonbirt Arboretum for some magical, enchanted Christmas cheer to get me in the mood! I was invited to use a Co-Wheels low emission car (which was, very handily, right around the corner from where we live) to go to Westonbirt Arboretum’s Enchanted Christmas event. Co-wheels is an independently owned car club which specialises in low emission, hybrid and electric cars. You can hire the cars on a pay-as-you-go basis, which is great if you need a car every now and again and for short journeys like this one, but don’t want the hassle of owning a car and trying to find parking (which, if you live pretty much anywhere in Bristol, is a nightmare!!). Plus, it’s super easy to sign up and get started – you get sent a smart card in the post and you use this to ‘unlock’ and use the car, using the online booking system. And for those of you who don’t know, Westonbirt light up the hundreds of trees they have at the arboretum with colourful and ambient lighting. It sounds a bit strange, but the effect is simply beautiful! I’m afraid I couldn’t do the lit up trees justice with my iPhone…my camera was non-functioning however hopefully you can see how pretty and atmospheric it was! The trail took around an hour or so to go around – or longer if you stopped off more and took loads of photos like we did! So perfect for a family outing. I have to say it was lovely seeing it so busy at night, and their were points along the way here you could grab a snack or some mulled wine – yummy! Check out www.forestry.gov.uk/westonbirt-christmas for more information of what’s on at Westonbirt into the New Year, and I would seriously recommend looking in to the Enchanted Christmas event for next year. Also, for more information about Co-wheels, visit www.co-wheels.org.uk or you can join as a member here. I was a little bit in heaven last Thursday. I got invited to the launch event for the Ted & Muffy A/W collection at the newly renovated and refitted store on Milsom St in Bath. The evening began with some nibbles, Prosecco and a browse around the store, before we were given an introduction to the shoes and the story behind Ted & Muffy. The brand has come from what used to be DUO, but it’s been given a serious makeover in terms of their offering and the general look and feel. The shop was lovely too, with lots of exposed brickwork and a clean white finish that, with the lighting, set off the shoes and and boots beautifully. And can we just take a moment to appreciate the branding. I love it! The drawings are just lovely and fit brilliantly with the whimsical, yet classic, style of the store and the boots themselves. The brogues were beautiful too. A girl can never have too many brogues… (pretty sure that’s a well known saying somewhere). We were invited to try on any pair we liked, and although I was totally torn between over-the-knee boots and a pair of lace-up ankle boots, in the end the over-the-knee style won me over. I am totally indecisive most of the time, and the amazing choice didn’t make it any easier! The leather is so soft, and they fit like a glove. The expert fitters were on hand in the store to make sure I got the perfect fitting pair – they not only make sure you’re wearing the correct shoe size but check your calf width as well, to make sure that the boots look and feel great. This pair are the Quest boots. And when I wear them I certainly feel like I can go anywhere and do anything!! Having not been exposed to the Ted & Muffy brand much before I am a complete convert now. The shoes are expensive, but they appear to be very well made, and so I’ll be checking out how they fare over the rainy Bristolian winter. If they survive that, they’ll survive anything! Add to that the amazing sounding plans for the next season, it looks like Ted & Muffy are on to a winner. An outfit post with these boots will be on here very soon!! This post has been a long time coming! You may remember my post about our newly renovated dining room (although I won’t blame you if you don’t, it was over a year ago!). So we had a bit of a break from house renovations after doing our dining room – mostly to save up again but also because we were starting to hate ourselves with all the painting and DIY that there was to do every evening/weekend. The next big project has been the lounge. We had a hole in our porch floor from where we had some pipes replaced and hadn’t fixed it yet, plus more artex on the ceiling, a porch which was taking up half the room, built in cupboards to get rid of…basically (and no offence to the previous owners) it was very much stuck in the late 80s/early 90s. The photos below show how it was when we first got the keys. This is the mid way point, earlier this year. It was so exciting – look at my excited face! And now…. I think it’s fair to say we’ve transformed the room! We put the same wood flooring in as the dining room so it extends all the way through the whole of the ground floor, apart from the kitchen (on our to do list). I’m so pleased with the fireplace – despite this being a Victorian property and should have loads of original features, like many of the houses in our area it had been stripped of any character. I was so happy to find the brick fireplace underneath all the plasterboard! The plan is to eventually get a wood burner…maybe. The shelves are just some ply from B&Q but together with some brackets from IKEA. 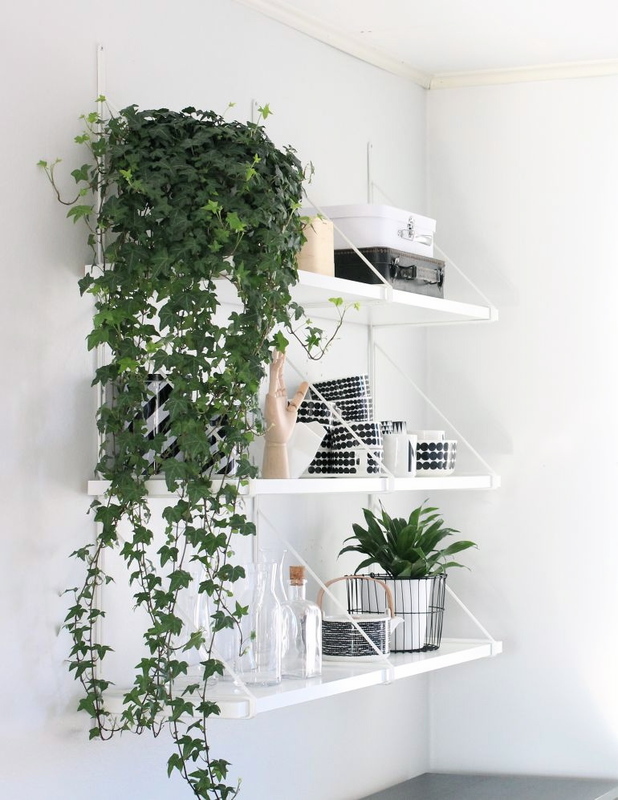 We were looking at String shelves but they were way too expensive, so after a few Pinterest browsing sessions we came across a similar idea using the IKEA brackets. We wanted to keep some wood in the room rather than just having white shelves, and I think it works really well. In fact they are one of my favourite features in our house now. The shutters are also something we’ve wanted for ages too. Lots of the houses in our area have them and I would inspect each and every one. I love them! We also have them in the bedroom, and eventually i’ll do a post on that too but it’s too much of a mess right now to take photos of. No, i’ve still not read The Glass Bead Game by Hermann Hesse. He is one of my favourite writers ever and yet that book has sat on my various bookshelves over the years almost untouched. I did try once, my friend and I both dared ourselves to read it but to no avail. Has anyone read it? Someone please enlighten me…should I try again?! This is Mira. She had just been spayed so had a scar on her side, poor little thing…we also have a boy cat called Orion but he was feeling a bit shy. I’m now starting to feel like we live in our own house. The whole place is really coming together and feeling like ‘us’ – I can’t wait o be able to show the rest it and how it’s looking, and the journey we’ve taken to get to this! I made this top quite a while ago but only recently got round to photographing it. It’s another Salme Kimono top (see my other top here), my second one in fact, and I’m really loving this pattern! The fabric is from John Lewis in the sale, I think I bought it last Spring, or maybe even earlier. It’s a sort of drapey crepe, you can find a similar pattern fabric in John Lewis here, but it only seems to be available in cotton (which would also work for this top, it would just have less of a drape). It was really nice to sew with if a little slippery, but it’s by far one of my favourite items i’ve made so far. I wear it all the time, and it’s perfect for dressing up or down too. For me, the fabric pattern and feel really help it to be quite versatile in that respect – it’s comfortable and laid back enough to wear as I have here – with sandals and jeans – and also if you put some smarter trousers or a skirt on, with some ankle boots. Hence why i’ve worn it so much, I guess! I’ll definitely be making myself another one of these tops soon – in fact i’ve already turned this pattern in to a dress I made for myself for our holiday in Sardinia, which you can sort of see below. It’s a minty green colour, with silver thread to make it a bit more interesting around the neckline and hem. There are loads more thing I’ve made which i’ve not blogged about yet, so watch this space for more posts! Aperol Spritz Socials – the best summer cocktail bar is in Bristol for the weekend! Last Friday night I was invited to an Aperol Spritz media event at the Severn Shed, ahead of the upcoming Bristol Aperol Spritz Socials this weekend and next weekend in Bristol. Now, I LOVE an Aperol Spritz, and being half Italian I couldn’t well turn down an opportunity not only to learn more about this awesome cocktail, but also be in for a chance to win a bottole of Aperol and Prosecco to take home! Our host for the evening, Aperol’s Brand Ambassador Loris Contro, told us all about the history of this famous Italian ‘aperitivo’ and showed us how to make the perfect Aperol Spritz, in 3 simple steps. As part of the evening there was also a competition to see who could make the fastest and best Aperol Spritz…a few of us entered, and it was so nerve-racking! Silly really, all you’re doing is making a drink as fast as you can in front of a load of strangers…!! Unfortunately I didn’t win…but I did come a respectable second with a time of 28 seconds! The girl who won made hers in 20 seconds – pretty amazing, and it tasted good! So tonight the Aperol Spritz Socials are coming to Bristol! In Anchor Square, Radio 1 DJ Clara Amfo will be there tonight to spin the tunes, and Aperol are going to be there from tonight and on 19th & 20th, plus next week too on 25th, 26th & 27th June. Apparently there are also going to be tuk tuks to take you and your cocktails between bars! If the weather stays as nice as it is today then I can’t actually imagine a better drink to drink than a nice Aperol Spritz…i’m not even kidding, it’s SUCH a perfect summer drink! I had a lovely time at the Bricks Magazine launch at Betties and Baldwins last week. Bricks Magazine is a self published magazine ‘supporting emerging creatives within fashion’. The magazine is full of beautiful fashion photography and shoots, and is printed on a lovely uncoated paper stock which gives it a nice feel. The launch was at Betties and Baldwins, a hairdressers and nail salon on Small St in Bristol. This also meant that I got to get my nails done for the first time by Kadi, the nail stylist there. The Bricks Magazine team were really lovely – they are Tori, Joe and Rachel and between them, plus a bunch of contributors and a lot of hard work, publish this great magazine. Thanks so much for the invite, and look forward to getting my hands on the new edition! It’s been a bit quiet on here recently, but we’ve had a busy couple of weeks. For the bank holiday weekend we visited Munich – my first ever time in Germany! We visited some friends who we met when we were travelling 5 years ago in South America – 2 years ago they visited us in Bristol and so it was our turn to visit them (they had been in South Africa before then which was a bit harder to visit, hence the 2 year gap!). Munich was a really lovely surprise – we didn’t really know what to expect (not having done any real research) – the only thing we knew was that it was famous for the Oktoberfest, so we were expecting to drink a fair amount of beer! Let’s also spend a minute talking about the pretzels. OHGOD, soooo tasty! I think beer and pretzels and cheese is a match made in heaven. We were there for 5 days and I’m pretty sure we ate a pretzel every day. And they seem to like their pastries and cakes too. Basically a coeliac’s nightmare, but everyone else’s dream. We’d been pretty worried about the weather all week – it had been amazing for the previous weeks but every time we checked the weather app in the few days before it just said torrential rain. However once we were there it didn’t really rain too much – it was mostly just overcast with spots of rain every now and again. So one of the highlights of our trip were to hire bikes and cycle round the city. Munich is the perfect city to cycle around – the bike lanes are pretty much all on the pavements – they’re really wide and spacious so you don’t have to worry about sharing the roads with cars, and it’s just a really relaxed city to cycle in. One of the stops on our trip was the Englischer Garten – a huge park in the north east of the city, which also had a couple of beer gardens which we had to stop in. Also, just on the edge of the Englischer Garten was this standing wave in one of the Isar’s tributaries – it was quite surreal seeing guys and girls carrying surfboards on their bikes throughout the city, especially with it’s proximity to the Alps! On the bank holiday Monday our flight back to the UK wasn’t until later in the evening, so we took advantage of the (finally!) good weather and went to Starnberger See – a lake south of the city – for a walk along the lake. We got the train that headed towards Tutzing, and got off at the penultimate stop to walk from there to Tutzing. This was more of the ‘real’ Bavaria – the houses all had fancy balconies and were decorated with paintings on the outside, and there were very few foreign tourists. The lake was beautiful, and you could just about see the alps in the distance, although apparently on a clear day they very clearly loom over the lake. I would really recommend taking a trip to Munich if you haven’t been before – it was really chilled, safe and a very pretty city. The food and drink were great and I would say it’s the perfect city break. Let me know if you want any more tips! Last Saturday 18th April we took a quick look around the Bespoked Bicycle show – having acquired some tickets through our printers at work (I think they printed all the brochureware and tickets for them), it seemed a shame to miss it. I wanted to go to it last year but we couldn’t make it, so it was good to be able to go and see what was there this year. The show was held in the Passenger Shed next to Temple Meads station. This was the first time i’d been to an event there! I know, I know…bad form. It’s a beautiful space, especially on such a sunny day. I mostly took photos of the pretty bikes…and there were so many amazing looking bikes! It was hard to know where to start with them all. They were all a marvel of engineering, and so many amazing colours, too, as well as quite a few wooden numbers. Tony and I did wonder whether a wooden framed bike would be a good idea in real life (he particularly commented on the mountain bikes with wooden frames), but they did look very impressive. This bike just above was one of my favourites, purely for it’s apparent simplicity, and the simplicity of the stand as well. It was just this one bike, standing on its own, looking very impressive. It’s by a company called AOI.CYCLE , although at a cool €1,599.00, I think I might have to save up a bit in order to afford it!!! Plus I would NOT trust Bristol with it – I don’t think i’d want to lock it up anywhere! This bamboo bike was pretty cool, but again we wondered whether it would stand the test of time? This one was by Virk Designs. These guys had a particularly cool logo and stand – Field Bicycles. Plus they had some of the nicest colour bikes (that’s about as technical as i’ll get!). How could I resist taking a photo of this beautiful turquoise number! I think they were all custom built for customers, so not for general sale. All in all it was a great show – particularly if you are reeeeaaally in to bikes. For me it was more about how ‘pretty’ they looked, and daydreaming about swanning around Bristol on a powder blue bike, with chrome mudguards and tan leather handles and seats…Well, maybe one day it might happen! The Ladyboys of Bangkok are oh so fabulous! Last night we went to see the Ladyboys of Bangkok in their popular cabaret show, over in Castle Park. I had no idea what to expect (to the point where when I told a work colleague, she was like ‘oh I thought you were going to see one of those Thai ping-pong shows…’) and no, it wasn’t like that at all! Their repertoire included songs by Rihanna, they did a 3 minute Sound of Music medley (AMAZING! ), Katy Perry, Tina Turner, Diana Ross to name a few! The masks for sale in the foyer were particularly fetching! Any opportunity to take a photo! This is when they did ‘Let it Go’ from Frozen. Although, I must be the only person in the world who has STILL not seen Frozen!! And from the sounds of it, i’m totally missing out. Their dancing was brilliant, and you couldn’t help but smile, sing and dance along while watching the show – I couldn’t have asked for a more random, funny and entertaining Monday night out with the girls! Tina was my absolute favourite. This ladyboy ROCKED every single act, and was hilarious to boot! This is definitely going to be an annual thing from now on. Next time we’ll do Friday or Saturday night, for sure!! The show was co-presented by Lucy Watson (of Made in Chelsea fame…i’m afraid I was a bit clueless as to who she was as i’m not a particularly massive MIC fan…), and featured high street shops from Cribbs – Topshop, Jigsaw, Gap, Superdry and Hobbs. The theme for the Spring/Summer collections was, of course, holidays and travel, which made for lovely colourful backdrops on the catwalk. My favourite looks were the pastels and florals – i’m not usually one for florals but there were some lovely prints, and the dresses were oh so pretty. It didn’t take us long to tuck in to it, after taking a few photos of ourselves and the clothes, of course. Thanks so much for having me, can’t wait for the Autumn/Winter show now!